رستگار, سعیده, رضایی, حسن, یوسفی, حسین. (1397). بررسی کارایی جاذب نانوفیبرلیگنوسلولزی در حذف سرب از محلول های آبی. مجله صنایع چوب و کاغذ ایران, 9(2), 251-262. سعیده رستگار; حسن رضایی; حسین یوسفی. "بررسی کارایی جاذب نانوفیبرلیگنوسلولزی در حذف سرب از محلول های آبی". مجله صنایع چوب و کاغذ ایران, 9, 2, 1397, 251-262. رستگار, سعیده, رضایی, حسن, یوسفی, حسین. (1397). 'بررسی کارایی جاذب نانوفیبرلیگنوسلولزی در حذف سرب از محلول های آبی', مجله صنایع چوب و کاغذ ایران, 9(2), pp. 251-262. رستگار, سعیده, رضایی, حسن, یوسفی, حسین. بررسی کارایی جاذب نانوفیبرلیگنوسلولزی در حذف سرب از محلول های آبی. مجله صنایع چوب و کاغذ ایران, 1397; 9(2): 251-262. در حال حاضر ‌‌‌‌‌آلودگی آب‌‌‌ به فلزات سنگین مانند سرب به دلیل عدم تجزیه پذیری، خاصیت تجمع پذیری و ایجاد بیماری‌ها و اختلالات مختلف جسمی منجر به نگرانی‌های عمده شده است اخیراً توجه زیادی به حذف یون‌های فلزی با استفاده از جاذب‌های زیستی به‌دلیل ارزان بودن، توانایی ذاتی برای واکنش با فلزات و فراوانی به علت طبیعی بودن شده است. هدف از انجام این مطالعه ارزیابی کارایی جاذب نانو‌فیبرلیگنوسلولز (نانوفیبرسلولز حاوی لیگنین و همی‌سلولزها) در حذف فلزسنگین سرب می‌باشد. فرآیند جذب به صورت ناپیوسته و در شرایط آزمایشگاهی با تأکید بر اثرات پارامترهای مختلفی مانند pH، غلظت سرب و مقدار جاذب بر راندمان جذب مورد بررسی قرار گرفت. به منظور تفهیم بهتر فرآیندهای جذب، ایزوترم‌های تعادلی تعیین شد. برای بررسی دمای جذب واکنش پارامترهای ترمودینامیکی نظیر انرژی آزاد گیبس (G∆)، آنتالپی(H◦∆) و آنتروپی(S◦∆) محاسبه شد‌. نتایج حاصل از این پژوهش نشان داد، تحت شرایط بهینه حداکثر حذف موثر در pH برابر 6، غلظت اولیه 10 میلی‌گرم بر لیتر سرب، مقدار جاذب 3/0گرم نانو فیبر لیگنو‌سلولز و دمای 25 درجه سانتی‌گراد، برابر 8/99 درصد بوده است. نتایج بررسی داده‌ها نشان داد هر دو مدل لانگمویر و فرندلیچ به خوبی می‌توانند جذب عنصر سرب را توجیه کنند، اما مدل لانگمویر در مقابل فرندلیچ برازش بهتری با داده‌-های جذب سرب دارد. بنابراین می‌توان بیان کرد که جاذب نانوفیبرلیگنوسلولز به طور قابل ملاحظه‌ای در حذف فلز سرب از محلول‌های آبی موثر است. نتایج حاصل از ترمودینامیک جاذب بیانگر خود به خودی، گرمازا بودن و افزایش میزان بی‌نظمی واکنش بوده است. بررسی تصاویر TEM بیانگر فیبری و شبکه‌ای بودن جاذب‌ نانو‌فیبرلیگنوسلولز بوده است. Rostami, K. and Joodaki, M.R., 2002. Some studies of cadmium adsorption using spergillus niger, Penicillium austurianum, employing an airlift fermenter. Journal of chemical engineering, 89(1-3):239-252. Ahluwalia, S.S. and Goyal, D., 2007. Microbial and plant derived biomass for removal of heavy metalsfrom wastewater. Journal of bioresource technology, 98(12):2243-2257. Amini, M., Younesi, H., Bahramifar, N., Lorestani, A.A.Z., Ghorbani, F., Daneshi, A. and Sharifzadeh, M., 2008. Application of response surface methodology for optimization of lead biosorption in an aqueous solution by Aspergillus niger. Hazardous materials, 154(1-3):694-702. Pamukoglu, M.Y. and Kargi, F., 2006. Batch kinetics and isotherms for biosorption of copper (II) ions onto pre-treated powdered waste sludge (PWS). Hazardous materials, 138(3):479-484. Wang, L., Meng, C.G., Han, M. and Ma, W., 2008. Lithium uptake in fixed-pH solution by ion sieves. Journal of colloid and interface science, 325(1):31-40. Ramesh, A., Hasegawa, H., Sugimoto, W., Maki, T. and Ueda, K., 2008. Adsorption of gold(III),platinum(IV) and palladium(II) onto glycine modified crosslinked chitosan resin. Journal of bioresource technology, 99(9):3801-3809. Chu, K.H., 2002. Removal of copper from aqueous solution by chitosan in prawn shell: Adsorptionequilibrium and kinetics. Hazardous materials, 90(1):77-95. Shukla, A., Zhang, Y.H., Dubey, P., Margrave, J.L. and Shukla, S.S., 2002. The role of sawdust in the removal of unwanted materials from water. Hazardous materials, 95(1-2):137-152. Deng, J., Kang, X. Chen, L., Wang, Y., Gu, Z. and Lu, Z., 2011. A nanofiber functionalized with dithizone by Co-electrospinning for Lead (ll) Adsorption from aqueous media. Hazardous materials, 196:187-193. Rajwat, D.S., Kardam, A., Srivastava, S. and Satsangee, S.P., 2013. NanoCellulosic fiber-modiefied Carbon paste electrode for Ultra trace determination of Cd(ll) and pb(ll) in aqueous solution. Environmental scienceandpollution research (ESPR) journal, 20(5):3068-3076. Yang, R., Aubercht, K.B., Ma, H., Wang, R., Grubbs, R.B., Hsiao, B.S. and Chu, B., 2014.Thiol-modiefiesd cellulose nanofibrous composite membranes for chromium (VI) and lead (ll) adsorption. Journal of polymer, 55(5):1167-1176. Kardam, A., Rohit Raj, K., Srivastava, S. and Srivastava, M.M., 2014. Nanocellulose fibers for biosorption of Cadmium nichkel, and Lead ions from aqueous solution. clean technology and environmental policy journal, 16(2):385-393. Lopicic, Z.R., Stojanovic, M.D, Marovic, S.B., Milojikovic, J.V., Mihajilovic, M.L., Radoicic, T.S. and Kijevcanin, M.L., 2016. Effects of different mechanical treatments on structural changes of lignocellulosic waste biomass and subsequent Cu (II) removal kinetics.Arabian journal of chemistry,5:120-129. Naddafi, K., Saeed, R. and Mohebbi, M.R., 2005. Bio-sorption and removal of heavy metals from water and wastewater. water and environment, 63:33-39. Crist, R.H., Oberholser, K., Shank, N. and Ming, N., 1981. Nature of bonding between metallic ions and algal cell walls. Journal of environmental science and technology, 15(10):1212-1217. Naghizadeh, A. and Momeni, F., 2015. Evaluation of graphen oxide nanoparticles efficacy inchromium and lead removal from aqueous solutions. 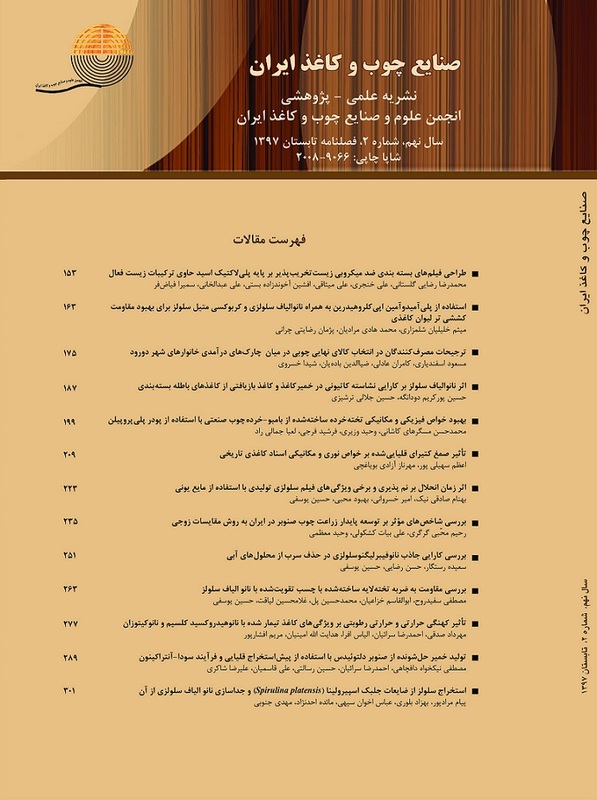 Journal of birjand university of medical sciences, 22 (1):27-38. (In Persian). Labidi, A, Salaberria, A.M., Fernandes, S.C., Labidi, J. and Abderrabba, M., 2016. Adsorption of copper on chitin-based materials: Kinetic and thermodynamic studies.Journal of the taiwan institute of chemical engineers,65:140-148. Gonzlez A., Villanueva, M., Piehl, L. and Copollo, G., 2015. Development of a chitin/graphene oxide hybrid composite for the removal of pollutant dyes: Adsorption and desorption study. Chemical engineering journal, 280:41-48. Sposito, A., Pagnanelli, F., Lodi,Solisio, C. and Veglio, F., 2001. Biosorption of heavy metals by Sphaerotilus natants: An equilibrium study at different pH and biomass concentration. Journal of hydrometallurgy, 60:129-141. Yan, G. and Viraraghavan, T., 2001. Heavy metal removal in a biosorption column by immobilized M.rouxii biomass. Journal of bioresource technology, 78:243-249. Maleki A, Mahvi, A.H., Zazouli, M.A., Izanloo, H.and Barati, A.H., 2011. Aqueous cadmium removal by adsorption on barley hull and barley hull ash. Asian journal of chemistry, 23:1373-1376. Dang, V.B,H, Doan, H.D. and Dang-Vu, T, Lohi A. Equilibrium and kinetics of biosorption of cadmium(II) and copper(II) ions by wheat straw. Journal of bioresource technology, 100:211-219. Quintelas, C., Rocha, Z., Silva, B., Fonseca, B., Figueiredo, H. and Tavares, T., 2009. Absorptive performance of an Escherichia coli biofilm supported on zeolite NaY for the removal of Cr (VI), Cd (II), Fe(III) and Ni(II). Chemical engineering journal, 152:110-115. Ge ,H., Hua ,T. and Chen, X., 2016. Selective adsorption of lead on grafted and crosslinked Chitosan nanoparticles prepared by using Pb2+ as template. Hazardous materials, 308:225-232.